THIS IS A VJ SHOW ONLY. 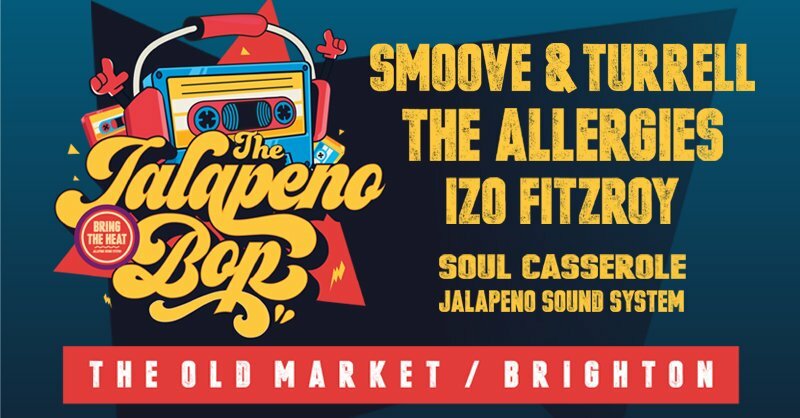 Brighton’s very own flaming hot funk label Jalapeno Records team up with saucy south coast beats specialists Soul Casserole to present the first in a series of party nights showcasing live bands and the finest DJ’s. Packed full of the kind of upbeat funkiness one would expect from two of the city’s bastions of funky dance music, the bill boasts three titans of the Jalapeno Records roster, plus sets by resident DJ’s from Jalapeno and Soul Casserole. The first bop presents performances from Gizelle Smith, Smoove & Turrell and a DJ set from The Allergies. In a change to the previous line-up, we are sad to announce that due to a medical issue, gospel blues singer Izo FitzRoy has been advised not to sing until the new year, and is unable to perform. However, we are very excited that Gizelle Smith will be stepping in to get the party started. The inimitable Gizelle Smith is an electric performer and the newest addition to the Jalapeno Records roster. Making a name for herself fronting the German funk and soul outfit The Mighty Mocambos, she has built a solid reputation for dynamic and scintillating live shows with performances packed with emotion. Following Gizelle, the mighty Geordie funk outfit Smoove & Turrell will be the headline live act, bringing the warmth, soul and above all the party vibes that they are famous for. Four albums deep with regular national radio support from the like of Craig Charles and Gilles Peterson, this will be their first headline Brighton show. Bristol’s finest DJ duo The Allergies round the night off with their signature blend of Funk, Soul, Hip Hop and Breaks that has seen them rocking crowds and topping charts worldwide. Their new album Push On has seen the duo break through into the national charts with strong support from BBC 6 Music who made them 'Album of The Day'. With this line up the event promises to be a real winter warmer and the perfect start to the Festive season.